Last week, Cincinnati City Manager Milton Dohoney unveiled the city’s plans for modernizing its parking assets through what he called a public-public partnership. The plan calls for a 30-year lease on thousands of on-street parking meters, and a 50-year lease on 2,363 spaces in five city-owned garages and four city-owned lots. The deal includes an initial $92 million upfront payment, and an estimated $3 million annual installment payment. The other public partner in the deal is the Port Authority of Greater Cincinnati, who would oversee the operation of the parking assets. Xerox would work with the Port Authority to manage on-street spaces, while Denison Parking would help manage the garages and lots. The financing muscle behind the deal would be AEW Capital Management and Guggenheim Partners. City officials note that the collection of private partners will be known as the ParkCincy Team. 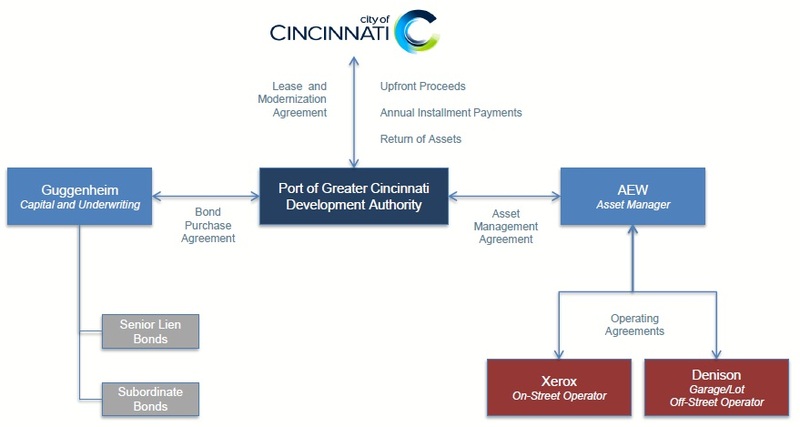 The organizational structure under the proposed parking asset deal would keep the City of Cincinnati in charge. Provided. 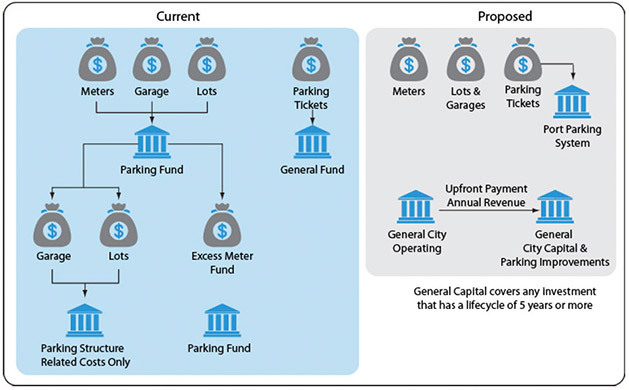 In addition to the complex financial structure of the deal, the City of Cincinnati will see its parking assets dramatically modernized in the coming years. All on-street parking meters will be replaced by electronic meters that accept credit cards, and will be monitored to allow for those searching for a parking space to get real-time information on parking availability. Several parking structures throughout the center city will also be overhauled. The crumbling Pogue’s Garage at Fourth and Race Streets will be torn down and replaced by a 30-story residential tower with a 1,000-space parking garage that will reserve more than half of the spaces for public use. Across the street, the 500-space Tower Place Garage will be renovated and expanded into the existing and vacant Tower Place Mall by another 500 spaces. The improvements to be made to the Pogue’s Garage site and Tower Place Garage are being assisted by $12 million in city financing made available through the lease’s upfront payment. The proposed deal would significantly simplify the City’s accounting responsibilities with regards to its parking assets, but it would shift the bulk of annual revenues to the ParkCincy Team. Provided. As part of that $12 million deal, the Port Authority will work with the developer to construct the planned $14.2 million 725-space parking garage, near the Horseshoe Casino at Seventh and Sycamore Streets, in place of the deteriorating parking garage at that site. The new garage’s development, meanwhile, is expected to jump-start the adjacent development of the proposed 115-room Holiday Inn & Suites. In order to make the deal worthwhile for the Port Authority and the ParkCincy Team, parking meters will be in effect from 8am to 9pm downtown, and 7am to 9pm in other neighborhoods. Parking rates will remain the same downtown, but rates will increase to $.75 an hour once meter upgrades have been made. Mayor Mallory’s Administration reviewed the bids and decided to take a lesser upfront payment in order to avoid some of the pitfalls experienced in Chicago, as pointed out by critics of Cincinnati’s deal. The City of Cincinnati sacrificed roughly $50 million in order to maintain control over certain aspects of the parking inventory including first ten minutes free at downtown meters, free parking on Sundays and holidays, and oversight on rate increases and enforcement. One very crucial aspect is that the city will retain control over the price of parking, which will be determined by a board made up of City and Port Authority representatives, and rate increases will be capped at 3% annually. $20.9 million to balance the City’s 2015 budget. City officials hope the $20 million for the MLK Interchange will accelerate its construction, but is contingent upon the Ohio Department of Transportation (ODOT). The project, officials say, will have a $750 million economic impact and create between 5,900 and 7,300 permanent jobs. The administration’s parking modernization and lease agreement requires approval from the Planning Commission and City Council before being finalized. The Planning Commission will vote on the matter this Friday at 9am, with a full City Council vote expected shortly thereafter. Randy A. Simes contributed to this story. Previous articleHas the United States given up on building subway systems?